With the red-blue divide over immigration policy and our government shut-down, it’s a very stressful time to be an immigrant. There’s a trusted, welcoming place of equal opportunity in every community: the public library. In this interview, Melissa Theroux, Literacy Coordinator, at the Boston Public Library (BPL) will tell you about the BPL’s experience hosting a Naturalization Ceremony and establishing Immigrant Information Corners in partnership with the U.S. Citizenship and Immigration Services (USCIS). Please tell us about the Naturalization Ceremony that the Boston Public Library hosted for Citizenship Day. Melissa Theroux: On September 17th, 2018, we held a Naturalization Ceremony at the Central Library in Copley Square. It was an honor to be part of this inspiring event! 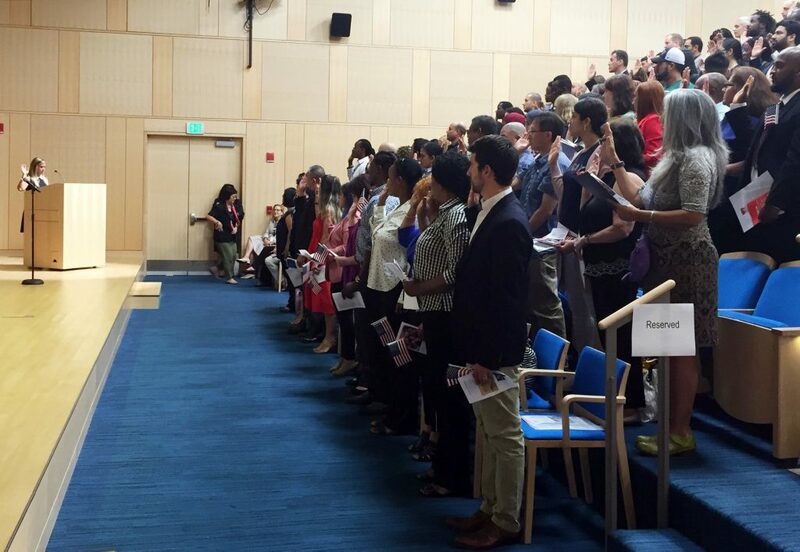 The idea for having the ceremony on Citizenship Day came from USCIS staff at the Boston office, specifically District Director Denis Riordan. The ceremony was held in Central Library’s Rabb Lecture Hall. We had a total of ninety new citizens naturalized that morning, along with their family and friends. Boston Public Library President David Leonard, a naturalized citizen himself, gave the opening remarks, with Judge Marianne Bowler presiding. We were fortunate to have the Back Bay Chorale (a neighborhood chorus that provides outreach to community programs) present to sing during the ceremony. Afterward, the new citizens and their families were invited to a reception, where community partners were on hand to assist them with signing up for passports and registering to vote. The USCIS staff were instrumental in introducing us to partners who provide these services. How has the BPL’s partnership with the US Citizenship and Immigration Services evolved through the years? 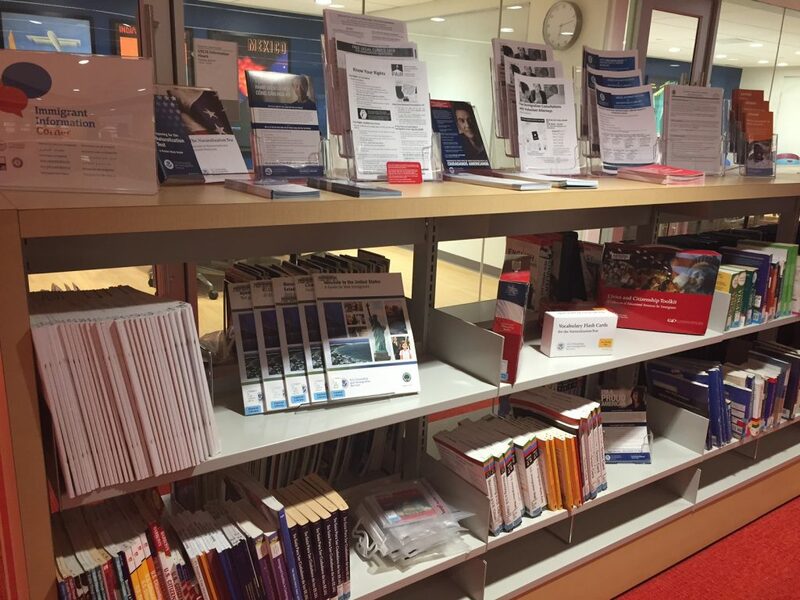 In 2015, Boston’s Mayor’s Office for Immigrant Advancement, US Citizenship and Immigration Services and the Boston Public Library began working together to establish Immigrant Information Corners in all branches of the library. These “corners” were designed to provide reliable information on the immigration and citizenship process to our patrons. They included “Welcome” booklets from USCIS, preparation materials for the naturalization test, and handouts referring patrons to community organizations that offer legal and social services to the immigrant community. The information corners were officially launched in the spring of 2016, shortly before we held a Naturalization Ceremony at our Mattapan Branch Library. Later that fall, the USCIS Boston office began offering Information Hours at six neighborhood branches. USCIS staff have continued these information sessions for over two years, providing assistance to hundreds of library patrons. During these hours, USCIS staff are available on a drop-in basis to answer general questions about the immigration and citizenship process. Additionally, this information has been presented in lecture style workshops at a few of our branches. In 2018, USCIS and the Boston Public Library collaborated on two additional events, the Naturalization Ceremony on Citizenship Day, and a training session for citizenship instructors titled “Bridges to Citizenship”. The training session brought together 90 citizenship instructors and volunteers to discuss best practices for preparing students for the Naturalization test and interview. What community partners contributed to Citizenship Day? We are grateful to the local community partners who participated in our celebration that day. During the reception, our guests were greeted by representatives from the MFA Citizens Program, which offers free one year memberships to the museum for newly naturalized citizens and their families. The MFA staff signed up a large number of new members that afternoon. We also had members of the East Boston Ecumenical Community Council assist new citizens with registering to vote. Lastly, we had staff from the State Department and the US Post Office on hand to help new citizens sign up for a US Passport and take passport photos. While our guests were milling around the reception, an exhibit was on display from the Norman B. Leventhal Map & Education Center titled “Who We Are: Boston Immigration Then and Now.” The Map Center, located in the Central Library, had recently created a mobile version of this exhibit and were happy to make it available during the reception. What feedback did you receive about hosting the naturalization ceremony and Citizenship Day events? By the end of the reception, our partners had served a large number of attendees. We were thrilled so many participants were able to sign up for these important resources. This entry was posted in Community Engagement and tagged Boston Public Library, Citizenship day, Naturalization Ceremony by Michelle Eberle. Bookmark the permalink.